Get A Discount On Every Smoke-free Building You Insure With MiddleOak! A significant number of apartment and condominium fires are a result of the careless disposal of smoking materials. 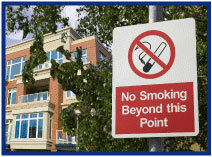 MiddleOak is committed to supporting owners and managers of both smoke-free complexes and smoke-free buildings that have designated smoking areas. In addition to attracting and retaining lower risk properties with rate levels that reflect the reduced risk of loss, MiddleOak is also aware of the significant reduction these properties have on building owner and manager operating costs. Many owners and managers have non-smoking properties in their portfolios currently and are interested in expanding their number of smoke-free buildings to leverage these benefits. Significant reduction in operating costs - The costs to rehabilitate a unit where there has been heavy smoking can be up to six times more than a non-smoking unit. Tenant health - Second-hand smoke risk is eliminated (Class A carcinogen). It's allowable in all states - This makes transition even easier. Marketing and educational materials make it easy for you to present the benefits and offer support to owners/managers of smoke-free properties or those that are considering transitioning properties to smoke-free. You can access electronic copies at middleoakinfo.com/smokefree. We are excited to be able to reward and support the owners/managers of smoke-free properties. We are looking forward to showing you how competitive we can be on your "best in class" habitational business! Time to watch your mailbox for the latest edition of the Big I Advantage Newsletter! Click here to preview the newsletter, which features updates and articles from all Big I Advantage areas. The cover story penned by Big I Advantage president Paul Buse highlights a series of "missions" you can complete to ensure you are taking advantage of all the member benefits available to you through Big I Advantage. To learn more about any of the programs highlighted in the newsletter, visit www.iiaba.net and click on "Products." Each year an estimated 600,000-800,000 medical professionals and staff are accidentally stuck with a "dirty" needle. Nurses are the largest group that get a needlestick and the most commonly transferred diseases are Hepatitis-B, Hepatitis-C, & HIV. Devices designed to prevent this can be costly, though there are products like the "VanishPoint" syringe manufactured by Retractable Technologies that are 100% safe and have been available for years. Getting a needlestick actually falls under workers compensation and Travelers covers the cost of testing both the employee and the patient, something many workers compensation policies don't do. Workers Compensation - Travelers Select can be found on www.bigimarkets.com and is currently available in all states except AK, CO, DE, HI, MA, ND, NM, OH, PA, WA & WY. August 1. "First Monday LIVE!" is a free monthly webcast hosted by the VU's own Bill Wilson and guests on the first Monday of the month to discuss the wide world of insurance from seemingly non-insurance topics. Each 30-minute webisode covers "what's going on" in the news and the implications. The August broadcast is in development as subject matter is explored. Click here to learn more and register and here to access the recordings. August 23. "Fixing Commercial Lines Coverage Gaps" Through scores of real-life claims examples and court cases, this program examines common coverage gaps found in many commercial lines policies and addresses the remedies for such gaps in the form of insurance products or risk management techniques CE credit available for attendees in AZ, CT, ID, MI, NJ, ND, WA, WY. Click here to learn more and to register. Rate filings? Yes, in the lines of business Big I Advantage has programs for you, your national staff monitors rate and form filings. This would certainly be the case with agency professional liability but also personal umbrellas. From filings we can learn the size of books of business, we see changes in policy forms and of course, we see when rate changes are made. But, what else can one find in your typical rate or form filing? A lot. Case in point: recently, we obtained a rate filing for a personal umbrella provider you actually have access to. It is part of the alternative umbrella offerings provided by Anderson & Murison (A&M). The filing is for a Berkshire Hathaway company and USLI group member, Mount Vernon Fire Insurance Company. We see placements by them with A&M for unusual risks and no better example exists than what jumped out from this rate filing. That is, the treatment of high profile individuals and other celebrities. Most standard PUP writers decline risks for individuals of well-known persons and these end up at underwriters like A&M and Mount Vernon Fire. 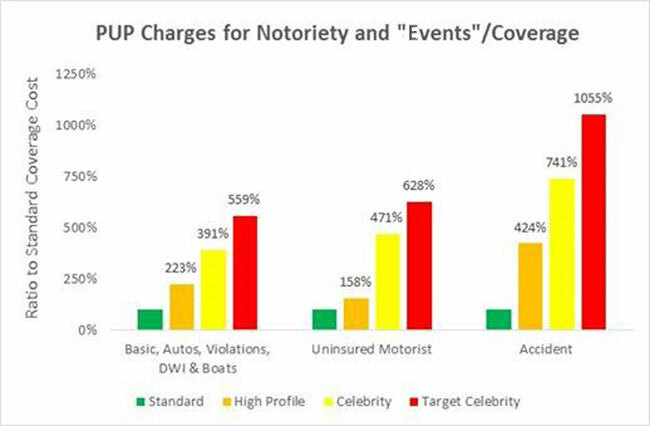 What we saw in the recent filing are three levels of what we'll call "risks of notoriety:" (i) High Profile, (ii) Celebrity and (iii) Target Celebrity. What is perhaps not surprising is the up-charge for accidents is accelerated over that of other chargeable events, but unexpected is that the charge for providing famous folk uninsured motorist coverage is increased for what would be not-at-fault accidents. So what is "High Profile," "Celebrity" and "Target Celebrity?" See if you can guess. Correctly identify the highest and lowest risk of those below as deemed by costs in the filing and we'll send you this complete list. That is, six of the eight below are "Celebrity" (middle risk of higher risk) and one is "High Profile" (lower risk) and one is "Target Celebrity" (higher risk). We will post the answer for everyone in the Two for Tuesday. Congratulations to our agent in North Carolina on a personal recreational vehicle sale of $8,076 in premium!